I will go on record stating that 1984 was a great year for genre films. We got Ghostbusters, Gremlins, Indiana Jones and the Temple of Doom, Neverending Story, A Nightmare on Elm Street, The Terminator, and that doesn’t even include some other equally entertaining films that hit theaters and drive-ins (I’ve covered The Last Starfighter, Night of the Comet. 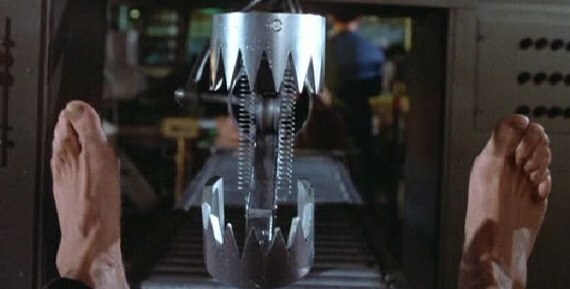 The Adventures of Buckaroo Banzai, and Sixteen Candles). 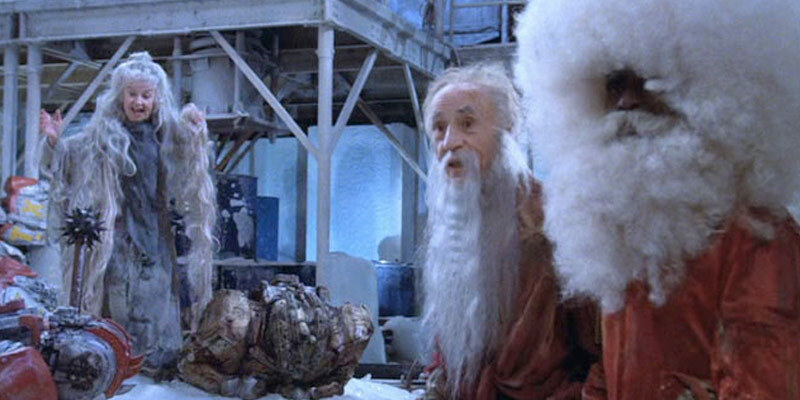 One movie to add to that list more than doubled its budget, was aimed at geeks, and falls into the space opera category: the humorous sci-fi film The Ice Pirates. 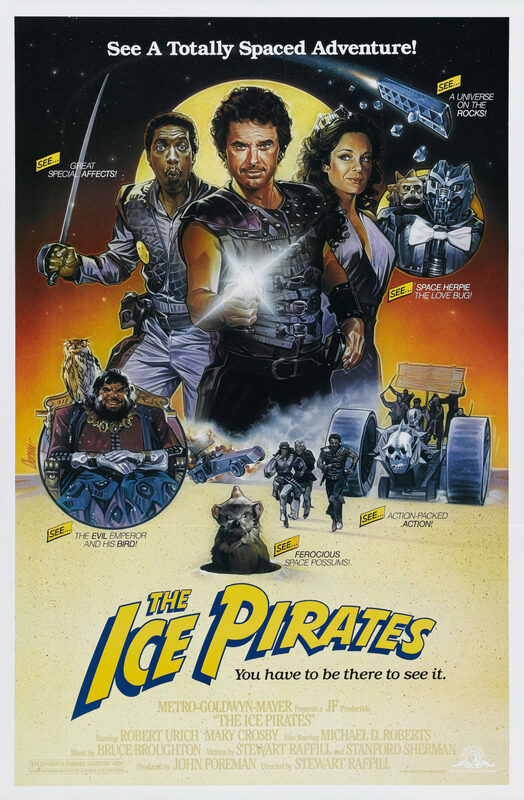 The Ice Pirates theatrical poster. The plot follows a space pirate (Robert Urich) who, with his crew, steals blocks of ice due to the interplanetary shortage of water. (Side note: when trying to build a dystopian world or universe, always rely on the scarcity of one resource that few hold the power to and the masses need to survive. It causes instant conflict and allows you to focus on other things such as tight pants and space herpes.) So there’s a water shortage and a mythical planet composed of water that will solve all the galaxy’s problems if it’s real. This being a film, any myth that is mentioned will inevitably turn out to be accurate, so our space pirate Jason and his plucky crew are in a race to gather clues to get to the water planet first. All the tropes are here: the gorgeous princess (Mary Crosby) who has a will-they/won’t-they banter with Jason (of course they will), the funny sidekick (Michael D. Roberts), the female warrior (Anjelica Huston), and an incredibly young Ron Perlman thrown in for good measure. Seriously, it will take him two decades before he gets covered in red paint to become Hellboy. 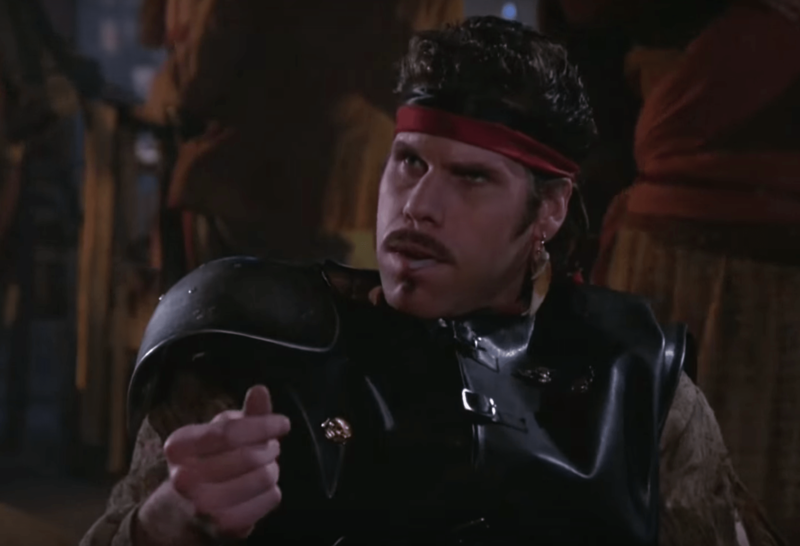 Seriously young Ron Perlman with a killer mustache. 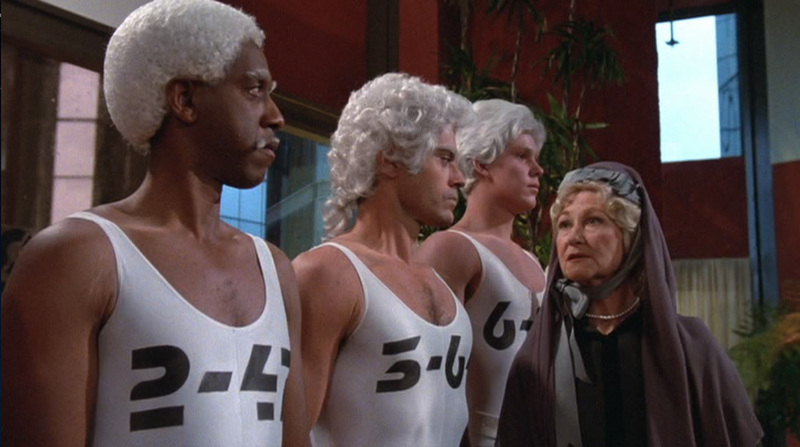 This being an ’80s comedy, there’s a lot of humor revolving around masculinity—or lack thereof. A somewhat running gag about eunuchs having high voices, because, you know . . . no balls. There’s also the aforementioned space herpes, as well as hitting on an androgynous alien that turns out to be a different gender than originally thought. It was the best of times, it was the worst of times. Robert Urich had a handful of films under his belt at the time but was primarily known as a television actor, and The Ice Pirates was his first starring role. It was rare at this time for television actors to transition to film, and even though the film made money, it was considered a disappointment at the box office and Urich primarily stayed on television for the rest of his career. Mary Crosby was also a hot television actress who was coming off the must-see show Dallas, and Michael D. Roberts has guest starred on so many television series he has the “you’d recognize him if you saw him” face. All in all, the cast seems to be having fun but can tell they’re making a B movie. One of the fun set pieces is the climactic final battle that takes place in a temporal vortex. Everyone ages very quickly in the fight and you see beards and hair get longer and longer. A bit that is really funny is Jason (Urich) taking time from an ongoing battle to see Princess Carina (Crosby) to find out she’s pregnant, and then of course with time fast forwarding, the battle is won by their son. Of course the good guys win, and everything reverts to the original timeline right before the credits start. It’s amusing and an interesting way to advance a character’s growth. Jason is forced to grow up and accept responsibility at the end of the film, since he knows what’s on the horizon; he might not have if he hadn’t known what was coming. Lots of TV shows and films explore this trope (Buffy the Vampire Slayer, any iteration of Star Trek, Minority Report, The Matrix, etc. ), but it doesn’t usually take place in such a finite amount of time. This movie might not be for you if you’re scared of giant afros. All told, The Ice Pirates is a film that won’t win any awards, but if you like B movies and references to other sci-fi franchises, then you should have a good time with it. Until they make Ice Pirates 2: Electric Boogaloo, it definitely remains a nostalgic favorite for me. It didn’t quite realistically portray castration. This film can be found on both Blu-ray and DVD. It is currently available via Netflix, but streaming offerings change frequently, so keep an eye out. Feel free to discuss further in the comments below; just keep it respectful.